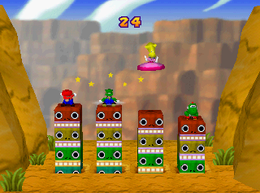 Totem Pole Pound is a 4-player minigame in Mario Party 2. The mini-game, as the name implies, requires the players having to Ground Pound the Totem Poles until they reach the bottom. The higher of the player's jump, the farther into the ground the Totem Bros. go into the ground. The first player who ground pounds the totem pole to the ground wins. Game Rules – "It's a race to see who'll be the first to use Hip Drops to pound the Totem Bros. into the ground." Advice – "The higher you jump when Hip Dropping, the harder you'll pound." Hippu de Don! Drumming hip! This page was last edited on December 11, 2017, at 10:38.